On Anti-Semitism in France: Inferiority Complex? 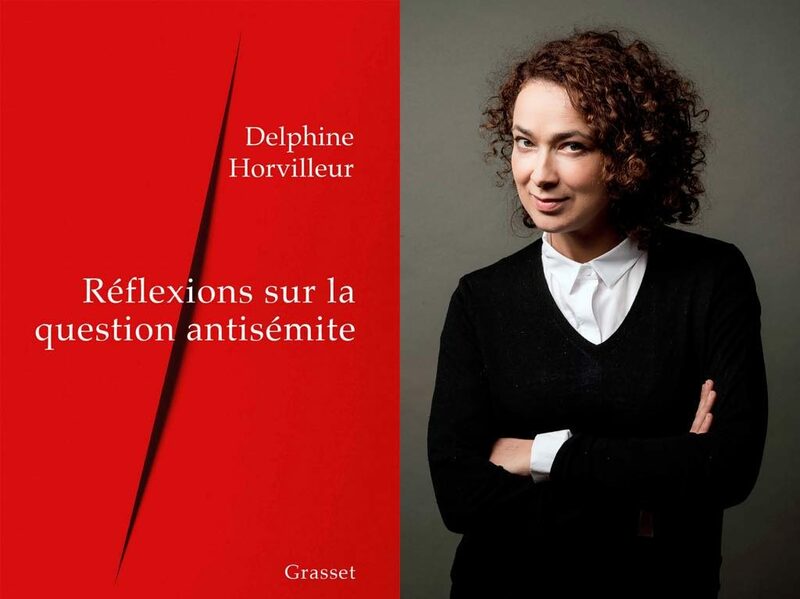 Delphine Horvilleur and the cover of her new book, Réflexions sur la Question Anti-Semite. Delphine Horvilleur, one of only three women rabbis in France, goes back to the origins of anti-Semitism in her latest book, Réflexions sur la Question Antisémite (Reflections on the Question of Anti-Semitism) to show how racism and anti-Semitism differ from each other. Racism, as she sees it, is the fear of the other who is obviously different from oneself – one who has skin of a different color, for example – while anti-Semitism is the fear of someone who looks like you yet is different. The same holds true in France, she said. “No one knows who is a Jew here.” Until recently, she pointed out, Googling the name of any famous French person – former presidents François Hollande or Nicolas Sarkozy, for example – would bring up among the most popular search keywords the word “juif” (Jew) next to the name, an indication that users were checking to find out if the person was Jewish (following a legal decision, Google is no longer allowed to associate the word “juif” with a name search). Her book also looks at the commonalities between anti-Semitism and misogyny, showing how the Jewish male is feminized in the eyes of anti-Semites and attacked for the same reasons women are despised and belittled: for being weak, parasitic, loving money, loving power, etc. In spite of a string of anti-Semitic attacks and incidents in recent years, Horvilleur pooh-poohed the widely publicized perception that Jews are now leaving France in droves, even though she acknowledges the increasing rate and seriousness of such aggression and has herself has become accustomed to receiving hate mail from both anti-Semites and right-wing Jews who see her as a traitor. While they cannot be ignored, anti-Semitic incidents are not “normal life” for her, however. “My family feels pretty secure in Paris,” she said. “You have to look at the whole picture. It’s also about a certain level of violence in society. An anti-Semitic act is one among others.” We can’t give in to fear, she added, as it paralyzes people and prevents them from acting. Born in 1974 in Nancy, France, Horvilleur belongs to the Mouvement Libéral Juif de France (Liberal Judaism Movement of France) and is the editor of the revue “Tenou’a – Atelier de Pensée(s) Juive(s).” Réflexions sur la Question Antisémite is her fourth book. My husband and I will be in Paris in late November/early December of this year. Would it be possible to send me the location of her synagogue so my husband and I can attend services?